Buying an engagement ring is probably one of the most exciting and yet stressful things that you will ever do. Not only are you worried about whether she will say "yes" to your proposal, you are also probably very concerned about whether she will like the engagement ring or not. It's important to remember that no matter how much you love the ring you will never be sure of how she is going to feel. All you can do is try to find the engagement ring that suits her personality the best. Although the result is not guaranteed, a ring from Novori will definitely help! Finding the best place to buy an engagement ring is another hurdle you are going to have to jump over. 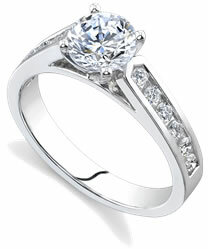 At Novori.com, you can shop online and browse thousands of engagement rings in the comfort of your own home. This will cut down on the stress of visiting many different jewelers and save you a great deal of time and money. You will save money if you buy your ring online from Novori because we guarantee the lowest priced diamonds. We don't advertise wholesale diamond prices because we all know a business does not sell wholesale but we do price our diamonds aggressively and will match our competitors prices if necessary. There are many different options when it comes to buying an engagement ring. You can design your own engagement ring and have one of our jewelers make it or you can simply have him help you come up with a design that she will love. Another fun choice is to attend a workshop on building your own engagement ring. Workshops allow you to sit down and make your own ring from scratch. This is a wonderful option when you are in the market to buy an engagement ring. Buying an engagement ring should always have an aspect of fun and excitement to it. You do not have to do it alone. Take a friend or better yet take one of her friends. She will be able to give you a good idea of what your bride to be would like to see on her finger each day. If you need assistance select the perfect engagement ring, just give us a call, toll free. We would be glad to help. Engagement rings can be old or new or even new with an old appearance. Antique engagement rings are very popular. These fantastic rings have so much class and elegance that it is hard for any woman to resist their charm. Buying an engagement ring that is a real antique is a decision that should not be taken lightly. Some people are really not very fond of antique engagement rings. They feel that is a little creepy to wear the rings of people who have passed on. If you are not sure whether your partner would like an antique ring then it would be best to stick with buying a new engagement ring. For expert advice, call us toll free at 1-877-877-4141 and have a consultant help you with your engagement ring and diamond choices. We have done this many times before!